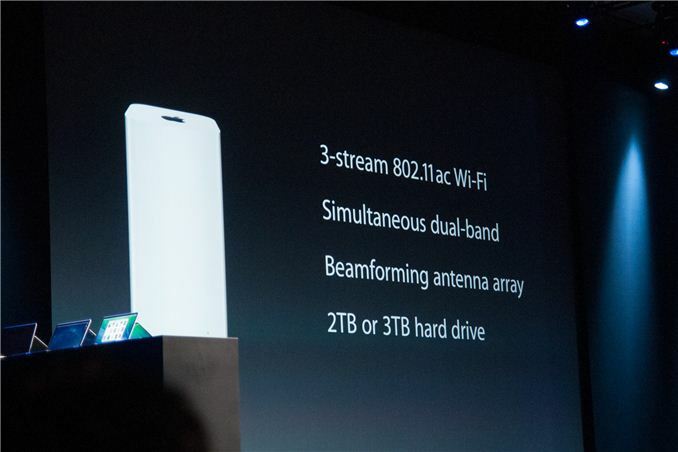 During the opening WWDC 2013 keynote, Apple announced a refresh of its AirPort Extreme and Time Capsule with support for 802.11ac. The two include 3x3:3 802.11ac with support for a PHY rate of up to 1300 Mbps and of course simultaneous 3x3:3 802.11n on 2.4 GHz (ac applies to 5 GHz only of course). From the outside, the new AirPort Extreme and Time Capsule look like a taller version of the AirPort Express which was released in 2012. The reason of course is to accommodate the 6 antennas inside, 3 for 2.4 GHz and 3 for 5 GHz for optimal orthogonality for 802.11ac's new beamforming. It's unclear at this point what chipset is inside the new hardware, but from the feature support and I/O it's pretty safe to guess Broadcom. On the back are a USB 2.0 port for printers or attached storage, three gigabit Ethernet LAN ports, gigabit WAN, and power. There's no optical toslink or analog audio out on the back of the new hardware, that only gets included on the AirPort Express. I searched around Moscone for the new hardware but was told it wasn't out being shown off, however availability in Apple stores June 12, at $199 for the AirPort Extreme, $299 for a 2TB Time Capsule, and $399 for a 3TB Time Capsule. I'm curious whether the new AirPort Extreme and Time Capsule are the same hardware inside, with a vacant SATA slot lurking inside. At time of announcement Apple also noted inclusion of 802.11ac in the new MacBook Air and Mac Pro. 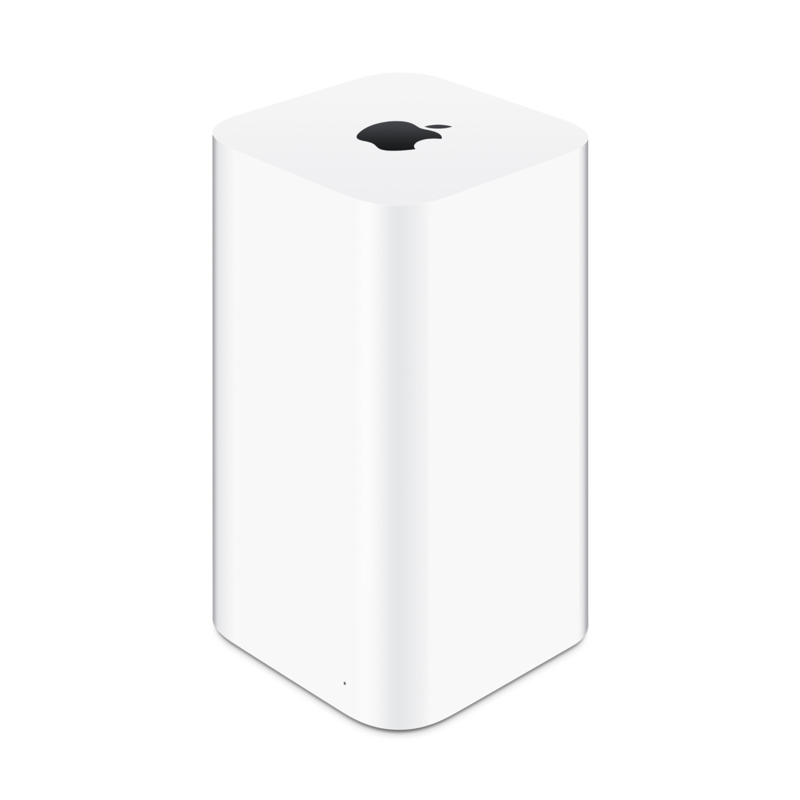 Apple today introduced completely redesigned AirPort Extreme and AirPort Time Capsule base stations featuring 802.11ac Wi-Fi for up to three times faster performance. Both are available today. AirPort Extreme is available for a suggested retail price of $199 (US). 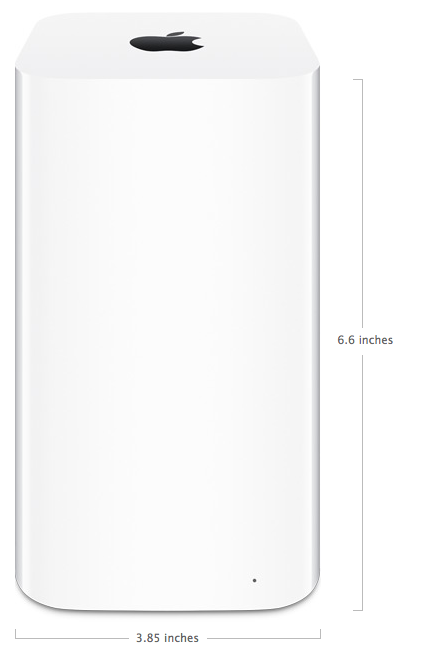 AirPort Time Capsule comes in two models: 2TB of storage for $299 (US) and 3TB of storage for $399 (US). 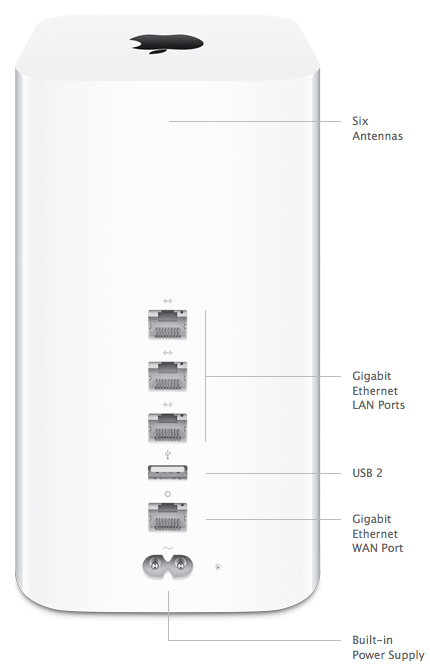 Additional technical specifications are available online at www.apple.com/airport-extreme and www.apple.com/airport-time-capsule.